If you are looking for a coach trip to a special event or attraction in the UK, you have come to the right place. We have great deals on coach trips to events such as Edinburgh Military Tattoo, Flower Shows, Grand Prix, Royal Ascot and many more shows and attractions are available for 2019. A selection of popular events are displayed below where you will find more information about the event and coach trip offers. The Royal Edinburgh Military Tattoo is being held between the 2nd - 24th August 2019 against the stunning backdrop of Edinburgh Castle. We have some excellent breaks that take in to this great event and allow for sightseeing and visits to local attractions. Enjoy a break to Britain’s holiday capital, bursting with thrills, excitement and entertainment. 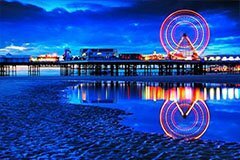 During Blackpool Illuminations (30th August - 3rd November 2019) you can be sure of a wonderful display that stretches five miles along the sea front. The Hampton Court Palace Flower Show is held in Surrey and is one of the most popular events for gardening enthusiasts. This is a popular event to visit by coach and it is advised you book early to avoid missing out on the best coach holidays. The Hampton Court Palace Flower Show is organised by the Royal Horticultural Society and is held at Hampton Court Palace in Surrey on 2nd July - 7th July 2019. 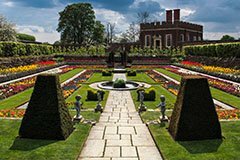 If you are an avid gardener it is a great break which can also be combined with a visit to other attractions and sights in London. 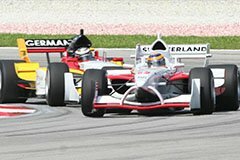 Book coach trip to the British Grand Prix in 2019 and experience the ultimate motor racing event in the UK. 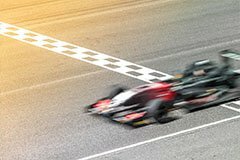 Coach breaks to the British Grand Prix including tickets to the circuit on Saturday and Sunday are available when the Grand Prix arrives in Silverstone on between the 12th - 14th July. Watch the World Champion Lewis Hamilton, Sebastian Vettel, Fernando Alonso and all the leading drivers through practice and the big race itself. Book coach trip to the 2019 Wimbledon Championships and enjoy the world's longest-running and most prestigious tennis tournament. 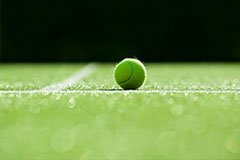 The Wimbledon Championship is taking place between the 1st - 14th July 2019 and will be an event not to miss. The world of tennis descends on Wimbledon in South West London every summer for two weeks of tennis, strawberries and cream, and good-natured queuing. 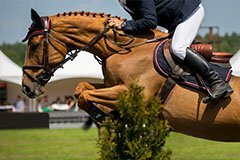 Book coach trips to the Cheltenham Festival for 2019 and enjoy the atmosphere, anticipation and action, played out on a beautiful sporting arena that has no equal. The Cheltenham Festival is taking place between the 12th - 15th March 2019 and will be a stunning event. The Festival is one of those rare events that engages everyone who comes into contact with it, never failing to to produce award-winning drama, enjoyment, camaraderie and sporting excellence in a cocktail for which no hangover cure is required. 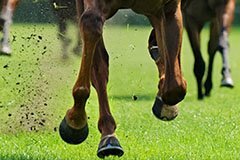 The next Randox Health Grand National at Aintree will take place on 4th - 6th April 2019. 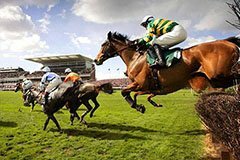 Grand National Festival is the most celebrated and spectacular racing events, which starts with Grand Opening Day on Thursday 4th and is followed by Ladies Day on Friday 5th, before Saturday's Grand National Day. The races will be watched at Aintree by thousands racegoers across the three days. 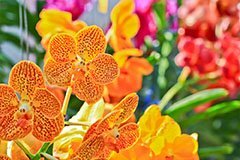 The World's most popular flower show takes place on 21st - 25th May 2019. This is the premier gardening and horticulure show of its kind and is a must see for gardening enthusiasts. Coach trips to the 2019 Chelsea Flower Show will go on sale soon. Our coach holidays to the Chelsea Flower Show offer excellent value and engaging trips you will enjoy. Coach trips to the Chelsea Flower Show leave from departure points across the UK so we are sure to have a holiday with a pick up point handy for you. Search for coach holidays to great destinations over the Easter weekend and bank holiday on 19th - 22nd April 2019. Coach holidays to the Isle of Wight, Paris and other great coach holiday destinations. 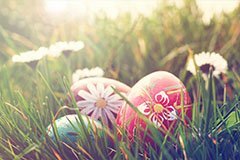 Whether you are looking for a coach break at Easter in the UK or further afield we will have a coach holiday to suit your taste and budget. Book coach trip to Royal Ascot in 2019 and enjoy one of the premier horse racing meetings of the year. Great coach packages are available for Ladies Day and the rest of the meeting. Royal Ascot is taking place between the 18th - 22nd June 2019 and will be a stunning event. Horse racing and fashion collide to produce a great event which attracts thousands of visitors each year. 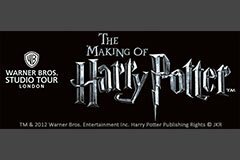 People the world-over have been enchanted by the Harry Potter™ films for nearly a decade. The wonderful special effects and amazing creatures have made this iconic series beloved to both young and old. Now the doors are opened for everyone at the studio where it first began and you have the chance to go behind-the-scenes and see many things the camera never showed. The Oberammergau Passion Play is only performed every 10 years, and this is your chance to experience it in 2020. 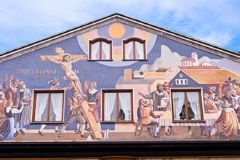 We have some excellent packages available for you to book your place at the Oberammergau Passion Play 2020. 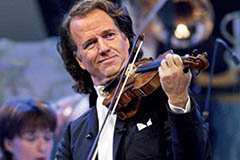 Take a great opportunity to see Andre Rieu with his Johann Strauss Orchestra live concert in Maastricht, Cologne or Vienna. We offer coach packages to see this unique musical performance and visit some of Europe’s greatest cities.